The perfect change for the savory breakfast lover. 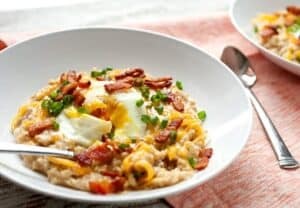 This oatmeal is served with crispy bacon, gooey cheese, and fresh chives! 1) Roughly chop bacon and add to a medium pot over low heat. Cook slowly, rendering out bacon fat until bacon is crispy, about 10 minutes. 2) Remove crispy bacon bits from pan and drain off most the bacon grease, leaving about a tablespoon. Add diced onion and cook for a minute, using the onion to scrape up any bits stuck to the pan. 3) Add rolled oats to the pan and stir for 15 seconds. Then add water. Bring to a simmer, turn heat down to low, and simmer for 8-10 minutes until oatmeal is thick. Season with a pinch of salt and pepper. 4) Meanwhile, cook eggs over-easy. 5) Right before serving, stir in grated cheddar cheese. Divide oatmeal between two bowls. Sprinkle with cheddar cheese and crispy bacon. Top each bowl with an over-easy egg and fresh chives. This delicious recipe was brought to you by Macheesmo. Read the full post at https://wp.me/pkSYO-del.